"Remember, suh, you are a Winslow." 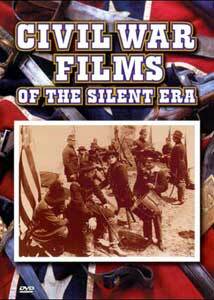 In the period 1911-1915, the fiftieth anniversary of the American Civil War, a plethora of films commemorating the event was released. This disc collects a feature from 1915 and a pair of two-reel shorts from 1913 which deal with different facets of the war, all directed by Thomas Ince. He was one of the notable pioneers of early American film, and was very highly-regarded in Europe, even more so than D.W. Griffith. This disc gives us our first look at some of his work to be released on DVD. Drummer of the 8th (28m:41s), the opening short, looks at first blush to be a formula melodrama. Fourteen-year-old Billy wants to join the Union army, but his parents refuse. Undaunted, Billy runs away and joins a regiment under an assumed name as drummer boy. When his regiment is captured, Billy overhears the Confederates' plans and escapes to notify the Union forces, though he is gravely wounded in the process. The film takes a few interesting turns that keep it from being a mere stock piece. Ince's skills are readily visible in this early picture, especially in cutting. While most of the film is done in tableau style, with a static camera displaying what the preceding title described, there are two notable exceptions: the eavesdropping scene and the climactic battle. In both cases, Ince uses intercutting to heighten the drama; by contrasting the rapid cutting with the tableaus, he creates an enormous amount of excitement and suspense. Unfortunately the concluding battle is quite brief and doesn't give as satisfying a climax as one might hope for. The Coward (1915, 01h:16m:49s), made a star out of the reluctant hero, Charles Ray. It remained highly popular and was reissued several times. Col. Jefferson Beverly Winslow (Frank Keenan) offers the services of himself and his son Frank to the Confederacy, but the father is rejected on grounds of age. Baby-faced young Frank (Ray) is not overly excited about enlisting; in fact he runs away from the enlistment tent, terrified at his own cowardice. Eventually the Colonel forces Frank to enlist at gunpoint, but the boy deserts nonetheless. When the Colonel learns of Frank's disgrace, he enlists as a private in Frank's place. While in hiding, however, Frank (in an echo of Drummer of the 8th) overhears the Union plans and learns of their weak spot and inability to reinforce it. In a dramatic chase scene, Frank gets the word to the rebels. While more formulaic than the first short, this is still an interesting film. The exaggerated sense of duty and honor of the father is nicely countered by Frank's desperation to avoid battle and his almost accidental heroism. There is occasional overacting, such as Ray's mugging to indicate his cowardice, but by and large the film is fairly restrained. It's clear that Ince wasn't interested in taking sides between Union and southern causes; rather, he's looking at the situations created on each side. In the third short, both Union and Confederate causes are treated with equal sympathy providing an eloquent balance to this set. As noted in the Image Transfer Review, the source materials are, in general, gorgeous for films of this age. The content is quite interesting, especially considering there were still a good many veterans of the war surviving at the time of their making and presentation. One can see the vocabulary of the cinema beginning to take shape through intercutting and ever-so-slight camera movement, taking us away from the completely static tableau style. Since disc producer David Shepard has indicated to us in his interview that he has more material for additional discs in this series if this DVD sells well, support for the disc will help us see more such less well-known material in the future. Image Transfer Review: The main feature, The Coward, is taken from an original tinted print. Although it was extensive projection wear, including several deep scratches which run throughout nearly the entire film, it is of very good photographic quality. A few short scenes or parts of scenes are interpolated from a dupey later-generation print and the shortcomings of the later material is immediately apparent. One is much, much happier with the clarity and sharpness of the earlier generation photographic materials, even if it means that there are significant problems with frame damage. The two-reel films are taken from the original camera negatives, and other than occasional speckling, are in absolutely breathtaking condition. It's hard to believe that these are films that are nearly 90 years old. The images are stable, crisp and clear throughout. In all cases, there are excellent blacks, a wide range of greys and sharp clarity of picture (except for the interpolations of the later prints in The Coward as previously noted). The contrast is suitably low, making these films quite as attractive as they appeared in the nickelodeon over four generations ago. Audio Transfer Review: The music score is by Eric Beheim and his synthesized "Cotton Creek Theater Orchestra." As would have been typical in period presentations, the music is a pastiche of classical themes from such composers as Tchaikovsky, Grieg, Beethoven, Mendelssohn and Liszt, combined with patriotic tunes from the Civil War. The scoring is generally appropriate to the pictorial representation and is clear and free of noise and hiss. There is good stereo separation between the various voices, although not distractingly so. The soundstage is broad albeit front-oriented. However, the music has a very mechanical feel to it; from my own experience I know that it's quite possible to make synthesized orchestral music sound very lifelike through variation of tempo and note start times. I would suggest that Beheim pay greater attention to this aspect of the presentation in future releases. This score could be much more pleasing than it is. Extras Review: Some brief production notes are presented on the Snapper case. Some biographical detail about Ince and Ray would have been nice, but we're left without any such information. Chaptering is marginally adequate; several chapters last far too long and should have been broken up into smaller pieces for easier access to a particular scene. Several interesting silent pieces by film pioneer Thomas Ince, given a very nice presentation at correct running speed. The two shorter films are in absolutely phenomenal condition. Lacking in extras, but recommended nonetheless.